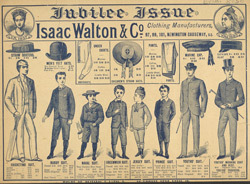 This is an advertisement for Issac Walton and Company, clothing store. A well bread man would never leave the house without a hat, whether it was a bowler, trilby, hamberg or a boater for the summer months. Men's hats made a symbolic statement about the wearer. The formal tall stiff top hat represented authority and was associated with the aristocracy as well as professions, whilst the more informal trilby felt hats symbolised democracy and were associated with intellectuals and artists. The bowler hat was introduced in the 1860’s as informal wear. It was made of hard felt with a bowl shaped crown and a narrow, curved brim. It came to be the most popular hat of the period.